Over the past couple of decades, Republicans have dramatically cut back public funding for higher education. Why? While the proposals are still taking shape, President Obama has already pushed for free community college, and has expanded an income-based repayment program. On the other hand, Republicans have released proposals that would open up higher education funding to massive cuts, particularly programs that give low-income students a shot at the American dream. Republicans have proposed removing guaranteed funding for Pell Grants, meaning that every year low-income students would worry about getting their legs cut out from under them. 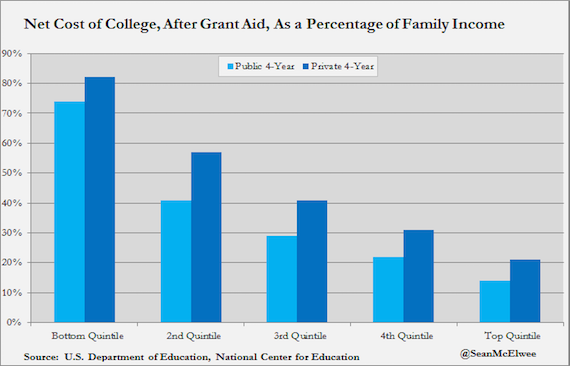 Already, Pell Grants have lost a large share of the value, from funding 76 percent of a student’s college costs in 1980 to 30 percent in 2014. What’s interesting about the Republican agenda, though, is that for a policy so widely shared among party elites, it’s actually deeply unpopular with voters. In a groundbreaking study two years ago, Benjamin Page, Jason Seawright and Larry Bartels examined the preferences of the wealthiest Americans, who are notoriously hard to poll. 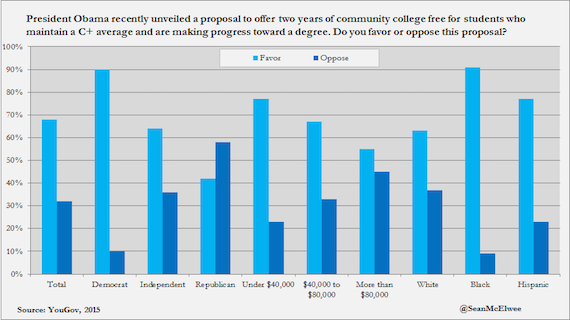 What they discovered is that the wealthy are strongly opposed to things that average voters support, and that education was one of the deepest chasms (see chart). What’s particularly surprising is that 42 percent of Republicans support the plan, even though the question explicitly notes that the proposal was released by Obama. The plan would cost $60 billion over the next decade (or roughly two years' worth of funding for the F-35 stealth jet -- which still cannot fire its gun).